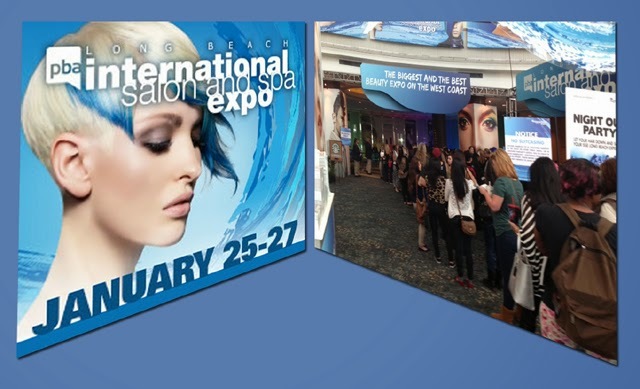 The 2014 International Salon & Spa Expo (ISSE) Long Beach Show is the West Coast's largest professional beauty event organized by PBA the Professional Beauty Association to advance the beauty industry by providing its members with education, charitable outreach, government advocacy, events and more. PBA is the largest organization of salon professionals with members representing salons and spas, distributors, manufactures and beauty professionals/NCA. This years Convention featured some the hottest new products, services and beauty style trends destined to leave their mark on the beauty industry in the coming year. With a estimated 40,000 attendees and a sold out expo floor of over 350 exhibitor's it can often be hard to find the really new exciting product innovations. I spent the day walking the show room floor. 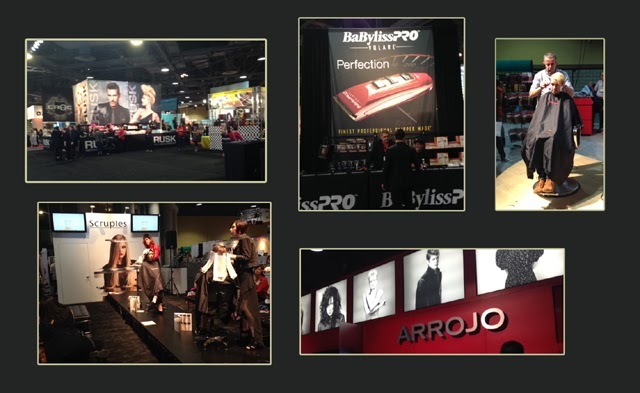 The convention was awash with special money saving offers and the hair styling demonstrations were interesting however not much has changed in the way of hair styles from last year. My feet were about to give in when I discover the shows newest beauty innovation at the far outer edge of the expo in the Chris Jacob exhibitor booth. I came to find out that Chris Jacob has been one of the leading experts in hair product innovations and distribution, having introduced hair extension systems to the beauty industry. 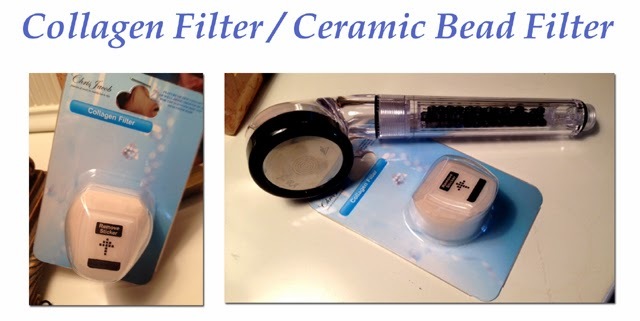 Their latest innovation is what I consider to be (21st century beauty technology) at its best. 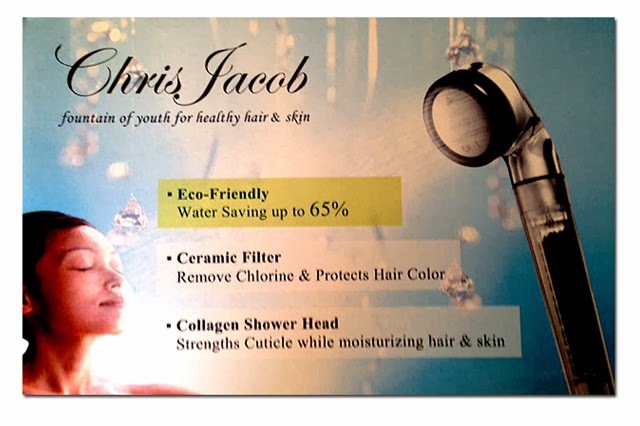 Its a Eco-Friendly water saving Shower Head Nozzle with a built-in Ceramic Bead Filter that removes chlorine and dispenses a Collagen Protein infused micro-mist that "strengthens" the hair cuticle and "protect" hair color while "moisturizing" the entire body, hair, scalp and skin. 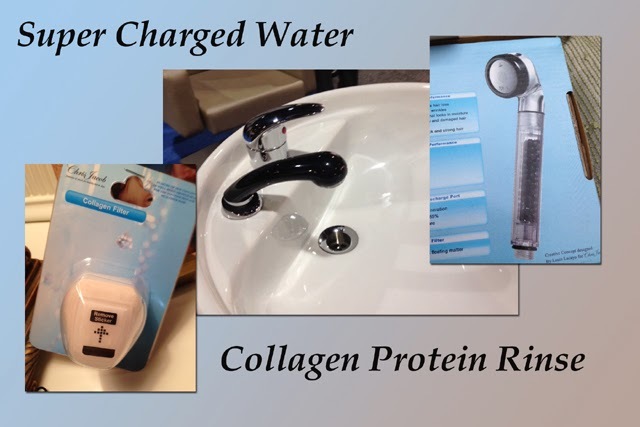 Chris personally explained how it works......... Water passes through the Ceramic Micro-Pore Pallets in the handle and breaks down the water molecules to creating negative ions much like a "waterfall" does. Next the purified negative ion water passes through a replaceable Collagen Protein Filter creating a conditioning protein micro mist that helps (reduce tangles, repair surface damage, seal in hair color) and maintains smooth healthy hair and skin. Like Negative ions, Collagen protein is essential to the health of hair, scalp and body. In addition a Fabric Filter removes dirt and floating matter from the main water sores. Setting the standard in beauty and trend innovation, Matrix , a subsidiary of L'Oréal USA has introduced the next generation of beauty education called "Matrix Class for GlassTM" featuring the Google Glass wearable device. 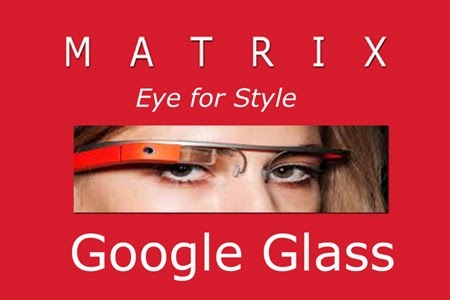 The "Matrix Class for Glass" is an ongoing program throughout 2014 that features a three-phase rollout, including Blogger Video Series, The Matrix Eye for Style Google Glass Salon Chair and a salon professional education platform. Also coming in late spring, the first Professional Google Glass App will house an exclusive library of content that can be downloaded by consumers and professionals. "This new initiative will completely transform the hair styling experience," declares VP/ Matrix General Manager Paul Schiraldi. "Wearable technology is the next frontier -poised to revolutionize the way we live and work, in the same way that smart phones and tablets have done. "We're extremely excited to be leading the way in professional and consumer hair education with this initiative," says Schiraldi. Using Google Glass technology and expertise from Matrix Celebrity Stylist, George Papanikolas one of Hollywood's most in-demand hair professionals and Matrix Artistic Director, Ammon Carver, intimate and in-depth tutorials will capture styling sessions directly from the eye of the stylist. These videos will offer a new and unique view from behind the chair and power the styling experience with unbounded technology. The "Matrix Class for Glass" video series will showcase a cast of America's best known bloggers as they explore the latest trends and share their experience. Videos will live on matrix.com, youtube.com/matrix and blogger social media channels. Additionally, launching later in the year, Matrix Celebrity Stylist, George Papanikolas will introduce the Matrix Eye for Style Chair at The Andy LeCompte Salon in Los Angeles. Consumers can take advantage of exclusive appointments with Papanikolas, who will capture each person's style and finish service via Google Glass and subsequently email the video to the client to serve as a personalized at-home tutorial. "Salon clients and women around the world have long lamented the fact that they're unable to have their talented hairstylists at their side to recreate their favorite salon hairstyles at home," says Matrix Celebrity Stylist, George Papanikolas. "Now, thanks to the technology of Google Glass and Matrix, the salon experience is forever changed." 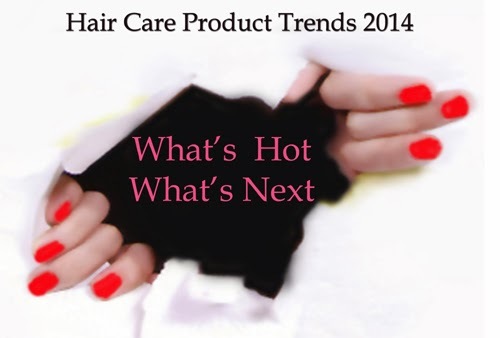 In a recent GCI article Vivienne Rudd, director of global insight, beauty and personal care for Mintel, a beauty research company took a look at what to expect in new product development for hair care in 2014. Rudd noted that hybrid products will be popular in the coming years. This includes hair care products such as hair perfumes (such as the Chanel Chance Eau Tendre Hair Mist), skin care crossovers that target the scalp (like the exfoliating scalp mask product from Phillip Kingsley), and products with makeup-oriented claims (like Alterna’s Caviar CC Cream 10-in-1 Complete Correction Leave-in Hair Protector ). In keeping with the growing consumer trend toward health and wellness the market for natural and organic hair care is likely to expand rapidly during the next five years,. Although the natural label can provide a point of differentiation the question still hang over what constitutes a natural brand. Not surprising styling aids like gels, creams, mousse and sprays have peeked and have been showing virtually no growth for the hair styling product market. In contrast, the hair colorant market is on an uptick. According to Rudd, the U.S. is by far the biggest market at $2 billion. Meanwhile, the power house Chinese market is growing slowly in hair color, but there is movement in the rising popularity of all natural henna color products. Dry shampoos continue to trend around the world, with the U.K. as its biggest market by far. Its also helping to spur the innovation of new products such as dry hair conditioners. Hair oils are on the rise too—a classic East meets West transition, explained Rudd, as hair oil products that are well known in countries such as India and Asia are only now growing in Western markets. However, many of the new hair oil launches like 9x Camellia Oil are making more modern claims, such as pollution protection and healing for hair, face and body, aimed to attract a more cosmopolitan consumer. Smart Tools, other emerging hair care trends include hair styling appliances that take tips from skin care devices, such as hot irons working with conditioners to ensure better penetration of conditioners, diagnostic products that show types and levels of hair damage, and even laser therapy used to treat hair loss. And styling tools like the Hair Flex Styling Brush with multi-functional uses for blow dry styling effects.